As Long As I Have Mr. Mouse and Something To Chew On, I’m OK!! What a difference a day and a little bit of food make! I relieved Philippe around 8ish. I had a long day in room 523, but Charlotte was happy and smiling for most of the day. By mid-morning Charlotte was getting about 10ml of Pedialyte an hour, continuous feed. Shortly after that, we switched her to baby formula, all through the tube still, and incrementally increased the continual feed volume. Once she proved that she could tolerate 30 ml/hour, we stopped the feed for an hour. At 4 pm, finally, I was allowed to feed her by mouth. 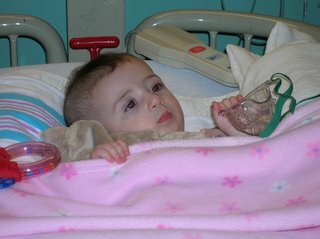 We gave her 2 ounces by tube and 3 ounces by mouth. She sucked the bottle down and gave a big old burp. Then, at last, my little Charlotte drifted into a deep sleep for her first nap of the day. Release criteria were simply that she tolerate a full feed–for Charlotte that is about 5 ounces. So, by 5:30 pm we were talking about release. By 7:30 pm we had our baby home. Phew! She ate, got fed by tube (what a mess!) and slept through the night. What was the day really like? Well, Charlotte barely slept. She was utterly exhausted, but still hungry. 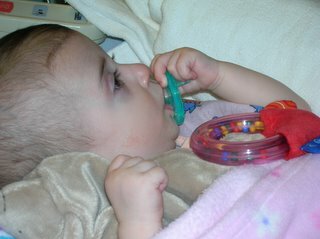 I think the hunger, the distractions of the hospital, and having me in the room with her prevented her from sleeping. She took a series of small (20 minutes or so) cat naps. She sat in my lap and listened peacefully to the same Dr. Seuss books over and over. 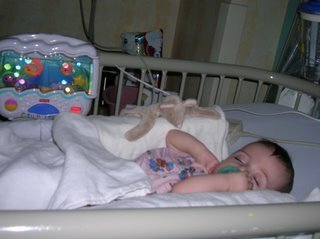 She lay on her side in the crib and stared at the Fisher Price aquarium. She chewed on her pacifier. She kicked her blanket off. Her lasix dose prompted “the great flood of 2005,” and we had to remake the bed and give Charlotte a sponge bath. I learned about the tube and met the nurse who will help us with the dressing next week and who will put the button in in January. Charlotte had a lot of visitors–her hospital Speech therapist, Susie, saw her name on the board and stopped by. Maureen, the caseworker who coordinated her discharge in June, came by and helped with some insurance issues. Dr. Stewart, the CV surgeon, and Elizabeth, the CV APN, stopped by to “check for cuteness,” according to the doctor. Another CV surgery nurse, Julie C., stopped in when Philippe was there. The nurse who took care of Charlotte after her angioplasty, Julie B., stopped me in the hall to chat. Several volunteers stopped in–most bearing toys and gifts! Our little girl was quite the star. Charlotte is lucky to have such a medical team. Each and every one of these visitors confirmed that while this isn’t the most fun thing we’ve had to do, the G-tube is the best thing for our little angel right now.